What is the Southfield Area Chamber of Commerce? 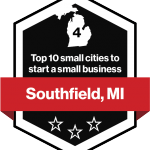 The purpose of the Southfield Area Chamber of Commerce is to create connections that drive and strengthen businesses in Southeast Michigan. We are a local association that promotes and protects the interests of the business community in a particular place, an independent, non-profit, member supported association – defined as a 501(c) 6 organization, a self-funded organization; not a government entity and not grant supported, believers in a stronger community – for business, employees and consumers, advocates of Southeastern Michigan, utilizing Chamber revenue to continually give back to our region. Businesses and nonprofits primarily join the Chamber for networking and business development, community engagement, educational opportunities, marketing, and to influence the voice of the business community through advocacy. The Chamber’s efforts are focused on business-to-business opportunities. We host more than 100 events a year, connect business leaders to the community through our various committees and peer groups, and more. We know your time is precious; therefore there are no monthly meetings. However, there are a number of monthly networking events we encourage members and non-members to attend in order to mingle with fellow professionals and build solid business contacts. Yes! The Chamber values our nonprofit members, which are an integral and defining component of our community. Nonprofits join the Chamber for a variety of reasons and consider the Chamber to be their avenue to the local business community. Your Chamber affiliation can help you secure donations, source volunteers, find Board members and promote your cause and good work. In addition to the core benefits, the Chamber organized a non-profit peer group, to promote the sustained vitality, enhancement, and development of the Chamber’s nonprofit member civic and community service organizations. Nobody values young professionals more than your Chamber. Southfield Young Professionals (SYP) was formed in 2017, with the purpose of serving YP’s 40 years and younger. It is our passion to help develop the next generation of leaders by making Southfield an attractive place for young professionals to live, work, network, learn and play. We create opportunities to socialize and develop professionally with other YP groups in Metro Detroit. Visit SYP’s Facebook page for upcoming events. It’s all about choice...and improved membership benefits. In 2019, after careful consideration by the Southfield Area Chamber of Commerce Board of Directors, staff and the membership committee, the Chamber is changing the way members invest. Like many chambers during the past decade, we are moving to a tiered dues system which provides benefits based on the investment level a member selects. You can contact the Chamber directly to set up a meeting to discuss which package best fits your needs, or apply online. I’d like to get more involved with Chamber. The Southfield Area Chamber of Commerce is currently supported by a Board of Directors and several working committees; ambassador, strategic, advocacy and membership. These committees are responsible for progressing the purpose of the Chamber and always looking for a few good people to serve and weigh in on important issues. I live in Southfield, and have a questions about XYZ? Click here for Important number at the City of Southfield. I’m looking to start a business in Southfield. How can the Chamber help? While the Chamber offers many benefits to member businesses, we do not offer tools to start a business. We recommend starting with Oakland County’s One Stop Shop, who has office hours in Southfield at Michigan Works. Where can I find information about sites and attractions and visiting Southfield? The Chamber is a rich source for hotel and restaurant referrals, and the Chamber staff is happy to help you find answers to your questions. The best place to find information on what to see and do when you’re in Southfield is the Community relations department at the City of Southfield. If I have a complaint about an Southfield business, should I send it to the Chamber? ​No, the Chamber does not process complaints. Complaints should be directed to the Better Business Bureau that serves our area, the BBB of Metro Detroit. It can be reached at 866-788- 5706 or file a complaint online by visiting the Better Business Bureau website. I am not a member of the Southfield Chamber. Can I attend Chamber events or referral groups? The Chamber welcomes area businesses to connect with our members and attend events to see all that the Chamber has to offer. Prospective members may register to attend up to two Chamber networking events (Wake Up to Southfield, Table for 8, BNG) in a calendar year as a guest before joining the Chamber. The Chamber reserves the right to deny admittance to the event if a non-member has already attended two events. Please contact the Chamber office admin@southfieldhamber.com with any questions or to join the Chamber.